Treat your family to these delicious homemade Spanish doughnuts sprinkled with chili-spiked cocoa sugar. 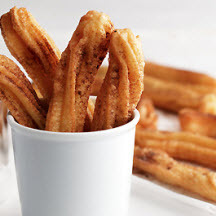 For Churros: In large saucepan, heat water and canola margarine over high heat, until mixture comes to full rolling boil. Immediately stir in salt and flour. Mix vigorously over low heat until mixture forms ball, about 1 min. Remove from heat. Beat in eggs one at a time and continue to beat until mixture is smooth. Meanwhile, heat canola oil in deep fryer to 350°F to 375°F (175°C to 190°C). Spoon mixture into cake decorator's tube, fitted with large star tip. Squeeze 4 to 5 inch strips of dough into hot canola oil. Fry 3 to 4 strips at a time, until golden brown in color. Turn during cooking time, about 2 minutes on each side. Drain on paper towels and immediately shake chili-spiked cocoa sugar mixture over top. For Chile-Spiked Cocoa Sugar: Sift all ingredients together. Place in shaker. Nutritional Information Per Serving (1/14 of recipe): Calories: 230; Total Fat: 21g; Saturated Fat: 2g; Cholesterol: 45mg; Total Carbs: 9g; Fiber: 0g; Protein: 2g; Sodium: 250mg.